Mommy, I want One Potato for dinner! When you're a parent you're expected to do things for your children, like love them, and care for them, and cook them dinner. The first two I manage to do, no problem. The whole cooking dinner thing, on the other hand, is not one of my strong suits. Mainly because in order to feed my children, I have to take them with me when I grocery shop. You load one (or both) of your kids into the car and head to the grocery store. In order to get them into the car you have bribed them with several different snacks and the promise of a cookie once you arrive at your destination. By the time you get both your kids and yourself buckled into the car, you are sweating and in need of a nap or a third cup of coffee. The only good thing about having children who wake up before dawn is that you arrive at the store early enough to find a great parking spot and a cart that wasn't used as someone's home the night before. You briefly consider using one of those sanitizing wipes on the cart, but then your kids start screaming for a cookie and you say "oh, f*ck it, germs are good for kids", and head into the store. You put your younger child in the cart's seat, and put the older kid in the basket of the cart. You are fully aware that this is unsafe, and that your older child will most likely get beaned in the head by something you throw in the cart, but you really don't give a crap because you are too tired to chase your rambunctious toddler up and down the aisles. You must go first to the bakery section to get the cookie you promised your children because if you don't there is no way in Hell you will get any shopping done. Yes, the bakery section is all the way across the store and you will have to double back, but this is far less of a hassle than your children having a simultaneous tantrum. You learned this the hard way last time, when you and your screaming kids were escorted out of Whole Foods by security. After plying your children with sugary baked goods, you make a mad dash through the entire store and attempt to get everything from your list before your offspring finish eating their cookies. It's entirely possible that you have broken the world record for sprinting without even trying. Your children have scarfed down their cookies and are now covered in crumbs and/or icing and demanding more snacks. Your older child is hanging over the side of the cart using his long arms to sweep rows of boxes off of the shelves and onto the floor. Your younger child is screaming "more, more, more!" and pointing at everything she sees. You are, once again, dripping with sweat. You run as fast as you can to the checkout counter in order to avoid further destruction by your children. Several people in line inform you that it's dangerous to have your son in the cart basket, to which you respond "Thanks, for letting me know", but what you really want to say is "go screw yourself, you interfering idiot". You realize that you have left your reusable shopping bags in the trunk of your car, but the thought of having to walk all the way to your car and then back into the store with both children in tow brings you to tears. You decide that your sanity is more important than the Earth and pay through the nose for a bunch of paper bags that will no doubt tear before you even get them into the house. You shell out somewhere in the neighborhood of $150 for a ridiculously meager amount of food that will last your children all of two days because they are freaking animals. You load up your bags, placing several directly on top of your older toddler in the hopes that the weight of the canned goods will force him to sit still. You push your 300 pound cart out to the car, load up your children (who are screaming about not wanting to go home) and then put the groceries in the trunk of your car next to all of those damn reusable shopping bags you never remember to bring into the store. This takes approximately 30 minutes, but nevertheless some lazy douchenoozle, who doesn't want to walk the extra five steps from the available spot three slots over, is waiting for you and beeps his horn to hurry you up. Once you get yourself buckled in, you take an extra five minutes to check your email just to piss off the idiot who wants your parking spot. Your drive home takes 20 minutes longer than usual because some idiot was texting and driving and took out a stoplight. Your children, of course, start screaming for snacks again, because it is physically impossible for them to go without sustenance for longer than five minutes. You silently count how many hours it is until wine o'clock. You finally get home and unload all of your groceries and both of your children. Your kids "help" you put away all of the stuff you bought, which takes about an hour longer than it would if you just did it yourself. You realize halfway through this exercise that you forgot to buy something to make for dinner, but there is no way you are going back to the store again today. Or ever. You wish that there was a way to have the ingredients and recipes for healthy, kid-friendly meals delivered right to your door, because you are not sure your sanity can withstand any more trips to the market with your kids in tow. 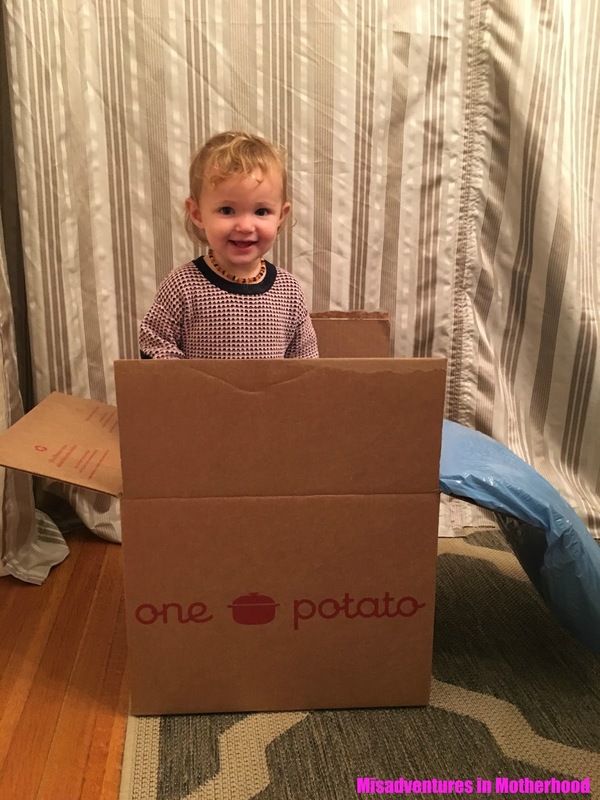 Here's the good news: The Hubster's new business venture, One Potato, is designed to save your sanity. You can learn more at their site (and sign up - use code OP10 for $10 off! ), but essentially One Potato delivers the recipes and partially prepped organic ingredients for three meals that you and your kids will enjoy. Unlike other meal delivery services, these really are recipes designed to please picky palettes - direct from the pages of Weelicious - so there's no reason to be concerned that you're simply going to get four portions of an exotic lamb dish that your kids will never eat. We've been testing recipes and I've been amazed at how much my kids have enjoyed the meals. Seriously, I've been shocked at some of the things they've eaten that I never thought they would try. Plus, it's kept me from having to take my kids with me to the grocery, which means I'm saving a lot of money on alcohol.